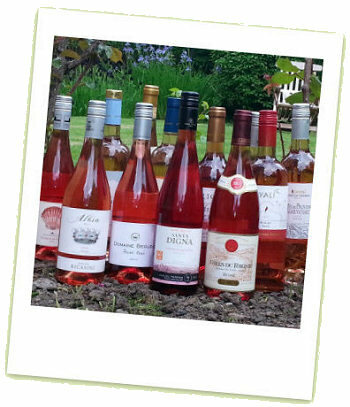 Each summer I publish my ‘rosé round-up’, collecting together the various rosés that I have tasted or received as samples over the previous couple of months. Previously I had wondered if the number of these had begun to fall, perhaps indicating a slowing down of the UK’s love affair with rosé. But I have to say that if the numbers being shown at tastings by the major retailers, or being despatched to me for review in 2013 are any indication, the category seems to be as strong as ever. Right: just a few of the samples to have landed on my desk, all tasted in late June 2013. One clarification: last year I got into trouble from one Italian wine lover for calling this a ’round-up’, when it seemed very much dominated by French wines and did not contain a single example of a rosé from Puglia in the south of Italy (his particular passion). The fact is, that this annual feature is not meant to be, and has never claimed to be, a comprehensive round-up of global pink wines. I’m afraid that Puglian rosé (for example) is as rare as hen’s teeth on UK shelves and although there are seven different wine producing countries represented in the 30 wines tasted here, the group of wines – predominantly French – is probably a very accurate representation of what the UK wine shelves offer the wine drinking public. 12.0%, Screwcap. This and the wine that follows from SPAR are both non-vintage wines that do not specify their grape varieties on the label. The slightly paler of the two, this from Spain’s eastern coast has a touch of floral and exotic fruit lift on the nose and a clean if dilute fruitiness on the palate. Fairly dry and nice fresh. 84/100. £4.50 (down from £5.19) until 31st July 2013. 12.0%, Screwcap. Quite a deep rose pink, with modest red fruit aromas and just a little hint of banana. On the palate it is dry and fresh, the fruit a little shy, but with a clean and appetising appeal. 83/100. £4.50 (down from £5.19) until 31st July 2013. 12.0%, Synthetic cork. Sister wine to the Cuvée de Richard red and white that have been really good value regulars on UK shelves in recent years, this 100% Cinsault from the Languedoc region has a pale to medium peachy orange colour and soft strawberry fruit with a nice, downy peach skin note. On the palate the hint of sweetness is very fleeting before a savoury, cool, nicely pithy palate and acidity comes through leaving this crisp and moreish. 85/100. £4.95, Waitrose. 13.5%, Screwcap. The cheapest rosé in this year’s line-up comes from Bodegas Borsao in Campo de Borja and is 100% Garnacha. The nose seems ripe, sweet and creamy with strawberry sundae aromas and a palate showing a nicely dry, watermelon freshness as well as a fair amount of creamy berries. Stylish and cheap, and dry in the finish. 85/100. £4.99, Waitrose. 11.5%, Screwcap. 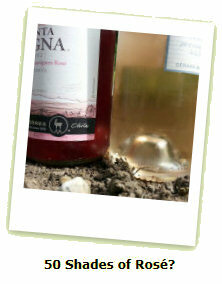 From Colchagua fruit, this rosé has only 11.5% alcohol and has a palish salmon colour. The nose is a little generic, with some soft red fruits and a touch of rose-hip, floral character. On the palate it certainly has some residual sugar, so much that I’d almost class it as off-dry, with creamy fruit and a strawberry and raspberry fullness. 84/100. £7.49, Majestic, but on offer at £5.99 until 2nd September 2013. 13%, Synthetic cork. Designated IGT Côtes du Lot, this comes from vineyards around Cahors. It has quite a deep, cherryish colour, and a vinous nose showing cherry and dry, cranberry character. On the palate it is bone dry too, that light, racy, curranty and rose-hip fruit pushing on, with a touch of spice and maybe a little tannin too. A food style, and enjoyable. 86-87/100. £8.99, Majestic, but on offer at £6.99. 13.0%, Screwcap. The grapes are not given on the label, but this has a pleasing nose with a touch of creaminess and richness, strawberry and raspberry fruit is all very attractive. The palate shows great fruit sweetness too, but the dry impact of the herby character and the acidity is food friendly and abundantly fresh. 87/100. £8.49, Majestic, but on offer at £6.99. 12.5%, Screwcap. Grenache, Syrah, Cinsault and old-vine Carignan. Pretty stuff, with its delicate peachy-pink colour and sweetly focused nose, the herb-touched dry red fruits all very delicate. The palate is almost like a white wine; clear, dry, punchy and lemony/herby, with a teasing touch of redcurrant. Delightful. 87/100. £8.99, Majestic, but on offer at £6.99. 13.0%, Screwcap. This Pays d’Oc wine has a light to medium cherry colour, and is an early-picked blend of Grenache and Syrah. Fairly muted aromatically, raspberry and redcurrant comes through, a touch of creaminess, but very discreet. On the palate the fruit shines through with a certain ripe and sweet-edged attack, and the freshness of this is very good, shimmering and long and even a touch mineral and salty in the very dry finish. Impressive and well priced. 88/100. £7.49, Waitrose. The South West’s Domaine de Pellehaut performs consistently well (part of the Maison Sichel group), white, red and rosé. This lovely salmon-pink wine is a blend of Merlot, Tannat, Cabernet Sauvignon and Syrah, and has a delightfully piquant nose with flowers and rose-hips, juicy cherry and a hint of white pepper. On the palate there’s a serious blast of ripe, sweet fruit, filling the mouth with black and red berries, a touch of creaminess and delicacy of apple blossom persisting. Clean, fresh but fruity and absolutely delicious. 88/100, £7.95, FromVineyardsDirect.com. 12%, Synthetic cork. Nice to see a rosé from the South West of France, especially when it is based on Négrette, star of the Fronton appellation, blended with a little Syrah and Cabernet Franc. Raspberry and Parma violets fill the nose, a lovely lift and summery fragrance. On the palate it has a juicy clarity, with a depth of creamy strawberry sundae fruit and that tart, raspberry acidity sharpening the easy-drinking finish. Delightful, and well done Sainsbury’s for offering something genuine and different. 87/100. £7.99, Sainsbury’s. 13.0%, Screwcap. Grown at 700m altitude in Mendoza, there’s 10% Shiraz in the blend here. It is quite deep in colour and aroma, more black fruited with a touch of something a tiny bit gamy and earthy. On the palate a more red wine-like experience, with lots of fruit intensity, a hint of tannin and a long finish softened by just a touch of residual sugar to cream the finish. 86/100. £7.99, Waitrose. 12.5%, Diam cork. Palish colour, this has a charming nose, with a little wisp of smokiness or woodland floor, a touch of herbs and dry red berries. On the palate it is racy and very fresh, that herb-tinged, dry and mouth-watering redcurrant, lemon and apple freshness is delightful into a dry finish. 88/100. £8.50, Oddbins. 13.0%, Screwcap. That beautifully pale Provence colour, though a little deeper than some, this blends Grenache, Cinsault and Syrah has delicate cherry and redcurrant, dry with a hint of pear. On the palate it is racy stuff, streaked with lemony acidity and with a nicely judged core of creamy red berries, just firm in the finish. 87/100. £9.99, Majestic, but on offer at £8.99 until 2nd September 2013. 12.0%, Screwcap. Well known for their Limoux Chardonnay in particular, this pale pink Pinot Noir from Domaine Begude has pleasing floral notes to the summery raspberry and strawberry fruit. In the mouth it is elegantly pitched, with plenty of sweet, fully ripe fruit, but a lovely core of dry, clean and citrussy acidity that drives through into a long, balanced finish. Tangy and delicious. 88/100. £9.99, Majestic, but on offer at £8.99 until 2nd September 2013. 13.0%,Screwcap. A blend of 60% Garnacha, 30% Viura and 10% Tempranillo from 30-year-old vines, fermented and aged two months in 1,000 litre wooden vats. Very pale and delicate colour, nice notes of tobacco and softly earthy, softly creamy fruit. The palate has a lot more raspberry and strawberry sundae sweet fruit ripeness than you might guess from the nose, really charming and finishing with fresh dry acidity. 87-88/100. £9.79, Waitrose. 11.0%, Cork. A blend of 60% Nerello Mascalese and 40% Garganega made by the Charmat (tank) method. Bouyantly fresh, raspberry and cherry scdented, with a touch of bubblegum and rose-hip aromatics. Frothy and delicious, there’s an off-dry, easy drinking approachability in a very sophisticated summer garden party fizz. 88/100. £10.49, Waitrose. 13%, Cork. Robust, powerful, lightly leafy and rhubarby stuff – ramping up the Provence character to 11/10. On the palate quite full-flavoured indeed, with plenty of orange and cranberry brightness and sweet/sour concentration, and a lovely long finish with shimmering, clean acidity. 88-89/100. £11.99 , Majestic, on offer at £9.99 until 2nd September 2013. 12%, Screwcap. This 100% Pinot Noir rosé has a pleasing, bright, toffee-nuanced red fruit nose with a nice floral, rose-hip note. There is a lovely hint of sweetness on the palate that really helps here – the finish is dry, with a shock of savoury citrus, but the fruit quality persists and the balance is good. 87-88/100. £11.95, camelvalley.com. 12.5%, Cork. A regular star of the Majestic range, this Provence rose ramps up the fruit concentration and pungency, a little Sauvignon-like hit of herbs and tropical fruits, but it is all reined back in on the palate as the dry cranberry fruit concentration persists. More gastronomic than some here, pair this with sardines or anchovies. 89/100. £12.99, on offer at £11.99 until 2nd September 2013. 13.0%, Diam cork. Classic Provence pale peach/salmon colour, and classic nose too, the dry rose-hip and cranberry scents, the redcurrant and slightly wild, garrigue aromas of herbs and flowers. Delightful palate, the racy citrus of the acidity scything through the refined red fruit, and enough weight, texture and just the merest hint of tannin and spice to give this savoury credentials. 89/100. £12.25, Oddbins.